There are roughly five and a half million car accidents in the United States every year. According to the National Highway Traffic Safety Administration, these accidents result in an estimated three million injuries and another 40,000 deaths annually. This is one of the reasons that traffic matters are the number one cause of lawsuits (many of them personal injury lawsuits) in the U.S. Traffic accidents can result in car accident injuries as well as pedestrian injuries (there is an accident involving a pedestrian about once every seven minutes). During the winter, there are three main contributors to the number of accidents. 1. Weather.<br ” />During the winter, weather is one of the biggest culprits when it comes to car accidents. Ice, snow, and slush cause the roads to become slick which can cause rear-end collisions and cars to slide through intersections. Additionally, precipitation like snow, sleet, and rain can all decrease visibility which can cause accidents as well. 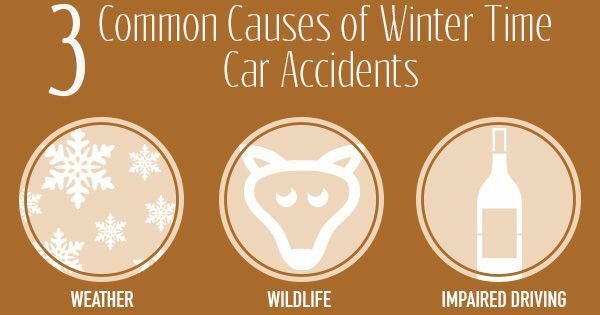 Another major contributor to winter-time car accidents is wildlife. Decreased visibility can make it harder to see animals crossing the roads, and slick roadways can make it hard and dangerous to react quickly to avoid hitting them. Additionally, just coming out of the fall mating season and into the winter hunting season means that animals are more likely to be on the move. There is also a risk of increased instances of impaired driving during the winter as well, since there are more holiday parties and opportunities to drink and drive. It’s important to always be responsible and choose not to drive after having anything to drink. Impaired driving is not just limited to driving after drinking alcohol, however. Taking some over the counter medications like cough syrups can affect a person’s ability to drive, which is a risk during the winter when there are more cases of cold and flu. There are a number of steps everyone can take to help reduce the number of these types of accidents, but it takes everyone’s participation. If you suffer a personal injury as the result of an accident, you should contact an attorney right away. Find one who has the right expertise and is well-versed in handling car accident cases.